In order to do anything in Africa, you have to take full control. Then, as you’re just about to take full control you are boldly reminded that this is Africa. You have no control. I had an assignment from the States to follow up on two hospital patients and document their progress in photographs. Jinsse and Tarike, two women admitted in February and now home with their families. Binyam, a young Ethiopian working tirelessly with the hospitals community outreach programs instructed me to find their fathers names and the kebeles in which they lived. I started with the hospital registers and quickly learned that in juggling english, amharic, and oromifa, no one spells a name the same way twice. Translating from amharic script, vowels are often doubled in an attempt to spell things phonetically for the ferengi. One name is spelled differently on each incarnation of the register, patient charts, lab cards, and prescriptions. Sometimes the name includes the fathers name, sometimes it doesn’t. No one keeps their cards, so a new one is made each time. If someone asks you to find someone by the name Jinsse, you might be looking for Jisse, Jinsse, or Jinsee and chances are the people wont know her name, only her fathers. In the end, it was the nursing students who remembered the patients and I closed the useless register. Jinsse was too far, a three hours walk and no vehicles would make it. Finding Jinsse would be impossible. Tarike, on the other hand, was close, just one kebele over. You can practically see her house from here. Africa lulls you into an acceptance of waiting. You actually believe things could be straight forward, that it will come together, as planned. Never, never, never fall for this. Let me assure you it is most certainly will not. Africa reveals itself slowly. Rushing one thing will inevitably complicate something else. In the two weeks we spent living in the hospital compound we accomplished a lot. Darlene was exhausted at the end of each day seeing patients and I was accruing video for my projects. But those accomplishments came with the price of waiting. Time, patience, trust and a lot of faith are complicit with unwritten schedules, vague complications, cultural under-communication, and over ambitious goodwill. There is a refusal to admit defeat and you rely on motorcycles that almost work but might need a part. When you are in Africa and you’re on a tight schedule, you miss a lot, because Africa rewards the patient traveler. However, if you surrender to Africa, you suddenly find yourself as I did, on my last day and still waiting. It was Friday morning and our flight would leave on Saturday just after midnight. We were an eight hour drive from the airport. In the end, it was cold hard cash that broke the wait. I hired a truck and invited Monica to join me and disperse shoes to the village children through one of her many outreach programs. We’d drive thru Tarike’s village, do a meet and greet, and then head over the hills and deliver shoes to children in the vicinity of Jinsse’s village and hope we might find someone that knows her family. I may have bought off the wait, but Africa was firm in it’s resolve. Tarike was not on the way. We couldn’t see her house, the village officers were not available to help us, and the bribes we’d have to pay did not inspire confidence. We’d need to see the village officers, but not today. It would be impossible for her to live in the village and the officers not know about it, I was assured. Deflated, I was now forced into a decision. Would we stay another day? 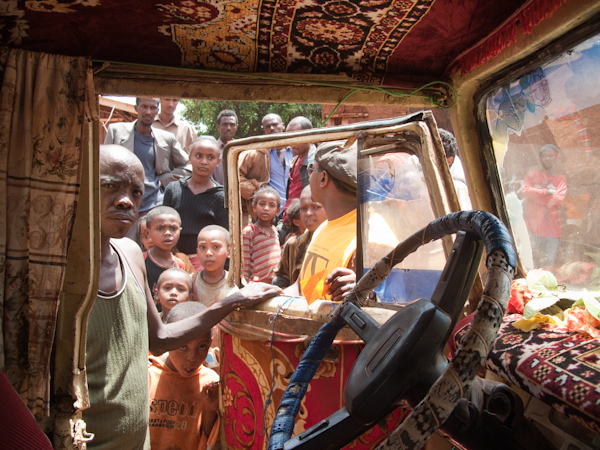 I would have to give up our seats in the land cruiser and instead take local transport to Addis, making the trip ten hours, instead of the eight. The shoe project went much better. We bumped along weathered dirt tracks rising over farmland hills and thru the heart of village life. We parked by a lone tree and unloaded two duffels of shoes while children ran across fields as word spread. Binyam fitted shoes to young girls offering their toes, their dresses worn and dirty, their waists wrapped in ropes which bound them to a future of heavy loads they would carry to support their families. But it was a beautiful afternoon full of goodwill and cheer. In fact, the goodwill was so overwhelming that one man, whose daughters were fitted with free, brand new shoes, was so pleased he charged only a small fee to lead us to Jinsse. After two weeks of hearing how far she was, how impossible to find, how remote, we actually found her standing on the side of the road in front of a relatives house. She practically had a sign over her head. I was so pleased with accomplishing the impossible that I decided we’d stay and find Tarike. I would give up our seats on the land cruiser and set out with Binyam, first thing in the morning. By noon the next day the motorbike still wouldn’t start and I spent the morning waiting. I was getting nervous and hungry, and Binyam was feeling pressure, so I took him out for kitfo, grabbing a sparkplug en route. 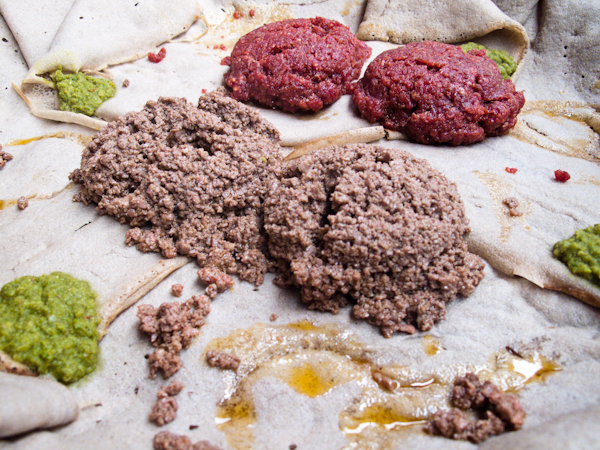 Kitfo, is raw meat with a hot green chili paste eaten on injera. Ethiopians are mad for it and it cheered him up considerably. I had my kitfo fried up to be on the safe side. I bought him a hen on the way home, a good egg-layer. The spark plug didn’t solve the problem. He worked thru the afternoon, it was three o’clock and no one at Air Egypt or Ethiopia Airlines would answer the well-published phone numbers on the world wide web. Changing our flights was out of the question, the search would end at sundown and I began to believe if I waited one more day, our luck would change. But that was impossible. Not Africa impossible, but real impossible. Unable to delay my departure, defeated, we decide to walk to her village. As we passed the Adventist Church, we notice an unused motorbike parked out front. With a little fast talking and the mandatory African waiting period, we procured the bike. Tarike was once again, right next door. I could almost see her smile. The race was on and skidding into the kebele we greeted the village officers. Tarike? Never heard of her. What?! Maybe you should try the next village over. My heart sank but the bike bounced along and we called out the village name as villagers pointed us in one direction or another. The road split several times and we took the wrong fork with each division. The day was coming to an end and we eventually ran into a group of Hararbe’s, muslims who had been airlifted from the Somali side of the country to the Sudanese side and set up in a makeshift village camp, like refugees. They only spoke arabic and so we could no longer communicate. We turned around, defeated and bumped our way back toward Gimbie in silence. And then, out in those hills in the earliest hours of dusk, Africa relented and we came across a group of women returning to their village on foot. Yes, said one, Tarike is my neighbor. Tarike cannot walk. Whatever she suffers, the womans own daughter suffers the same. Two months ago, the village carried Tarike to the hospital for care, and she was admitted, but nothing could be done for her. She is now home, an hours walk from where our bike idled. The bike would not make it, a bridge was out. It was late in the day. I looked at all the faces around me. Hardened by the earth, each carried a heavy load wearing battered shoes and beautifully patterned, but stained and filthy dresses. The future of the girls I saw yesterday. Tarike would have to stay where she was, they would not carry her again, unless they believed in the treatments she would receive. This was their story, but like the spelling of names, no two stories in Africa are the same. Binyam looked at me. He would return tomorrow, he was also stung from being so close but not having found her. He would make the hike and get her picture. No, I shook my head. In the middle of that forest, surrounded by the villagers faces looking at me, what was I really going to do? I could almost read it in their faces. Why was I there for Tarike, was this ferengi on the back of a motorbike really going to help? I had nothing to offer these women but I felt Africa wrap a brotherly arm around me as if proud for bringing me here. There was no doubt that I would be shown more if I stayed longer, but this is what I would see for now. Knowing I had a rocky ride home to survive, we turned the bike and headed out, white knuckles on the gear rack. Africa always surprises when you surrender to it and what you are seeking is not the reward you eventually find. As for our return to Addis, I received a call late in the evening. Minivan seats were available for us. We just needed to meet a boy named Howie at 4:30 in the morning under a street lamp across from the bus station. This did not impress Darlene and our ten hour, twenty hour ride to Addis is a whole other story that will need to wait. Inspired by the travels of Joni Kabana and Philippa Ribbink and their collaboration in travel photography and developing world medicine. You prove that good things can happen with surrender ! I always love these beautiful faces and smiles. I wonder , will you and Darlene ever be able to leave Africa? Jaybird, no worries for not finding her. I even wonder if this Tarike is the same, as the one we knew was fully able to walk, and her daughter as well. I love the way you write about the way Africa jolts the soul, expands the heart and pierces the meaning of well-being. Out of the confusion, the restlessness, the longing, is a tiny gift of truly feeling alive. Thank you for taking us back.